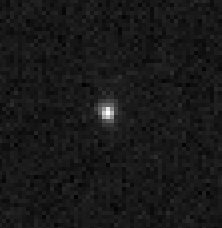 April 14, 2004: Astronomers studying thirty-five Hubble Space Telescope (HST) images of the solar system's farthest known object, unofficially named Sedna, are surprised that it does not appear to have a companion moon of any substantial size. This unexpected result might offer new clues to the origin and evolution of objects on the far edge of the solar system. Sedna's existence was announced on March 15. Its discoverer, Mike Brown of the California Institute of Technology, Pasadena, Calif., was so convinced it had a satellite, that an artist's concept of Sedna released to the media included a hypothetical moon. Brown's prediction of a moon is based on Sedna's slow rotation: it appears to turn on its axis once every 40 days. For comparison, almost all solitary bodies in the solar system like comets and asteroids rotate once in a matter of hours. Sedna's more leisurely spin could best be explained, reasoned Brown and colleagues, by the gravitational tug of a companion object acting to slow Sedna's rotation. "I'm completely baffled at the absence of a moon," Brown said. "This is outside the realm of expectation and makes Sedna even more interesting. But I simply don't know what it means." Immediately following the announcement of the discovery of Sedna, NASA astronomers turned the HST toward the new planetoid to search for the expected companion. The space-based platform provides the resolving power needed to make such precision measurements. "Sedna's image isn't stable enough in ground-based telescopes," Brown said. Surprisingly, the HST images, taken March 16 with the new Advanced Camera for Surveys, only show the single object Sedna, along with a faint, very distant background star in the same field of view. Even with Hubble's crisp view, it may just be barely resolving the disk of Sedna, Brown said. It's equivalent to trying to see a soccer ball 900 miles away. The Hubble images place an upper limit on Sedna's diameter of approximately three-quarters the size of Pluto, or about 1,000 miles across. 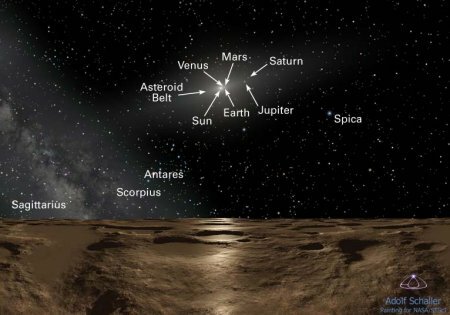 Below: Artist Adolf Schaller's impression of the view from Sedna, with points of interest labeled. Brown had expected the moon to pop up as a companion "dot" in Hubble's images, but the object is simply not there. There is a chance it might have been behind Sedna or transiting in front of it, so it could not be seen separately from Sedna in the HST images. But the chance of that is very low. Brown's estimate of Sedna's 40-day rotation period comes from observations of apparent periodic changes in light reflecting from Sedna's mottled surface. Sedna appears to be the slowest rotating object in the solar system after Mercury and Venus, whose slow rotation rates are due to the tidal influence of the sun. One easy way out of this dilemma is the possibility the rotation period is not as slow as astronomers thought. But even with a careful reanalysis, the team remains convinced the period is correct. Brown admits, "I'm completely lost for an explanation as to why the object rotates so slowly."